Vintage, 1/16", Twisted cord, Cream & Gold, 10 yds. Vintage, 1/16", Twisted cord, Cream & Copper, 10 yds. Vintage, 1/8", Cream & Gold Trim, 5 yd cuts. Vintage, 1/8", Herring Bone Soutache Trim, 10 yd cuts. 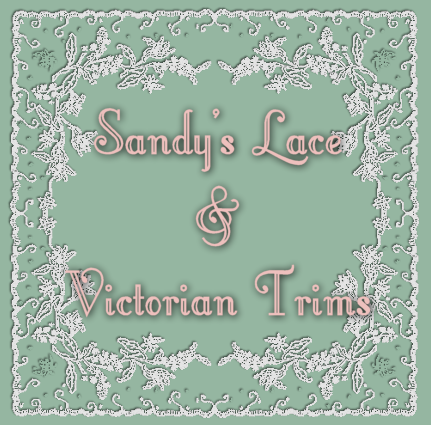 This is a vintage French Trim. It is Rayon and Metallic, 3/8" wide, it is an Ivory with Gold insert. Sold 2 yard cuts. Vintage, 1/8", Red & Gold tape trim. 5 yd cuts. Vintage, 1/8", Soutache, White & Gold, 10 yd cuts. Vintage, 1/8", Soutache, Black & Gold, 10 yd cuts. This is a 1/6" cording that unravels into a chain net. 100% Cotton Chenille, Brown, 1/8" wide, 10 yard cuts. 100% Cotton Chenille, Dark Green, 10 yard cuts. 100% Cotton Chenille, Black, 10 yard cuts. 100% Cotton Chenille, Brown, 1/4" wide, 10 yard cuts. 100% Cotton Chenille, Dark Red, 10 yard cuts. 100% Cotton Chenille, Victorian Rose, 10 yard cuts. This is vintage100% Cotton Chenille, 1/8" wide, Pale Yellow, 10 yard cuts or a three yard sample cut. This is another older French Ribbon, it is 3/8 inches wide. It is a peachy-pink ribbon with a white flowers. 2 yard cuts. This is a black 100%cotton fringe, Made in France, it is 1" wide, sold 3 yard cuts.